What is a Handgun Light? A handgun light or pistol light is a tactical flashlight that is mounted to your handgun. Many pistols these days are coming with rails on them that are specifically used to connect accessories like pistol lights and lasers. There are two types of rail systems that are used on pistols: The Picatinny rail and the Weaver rail. 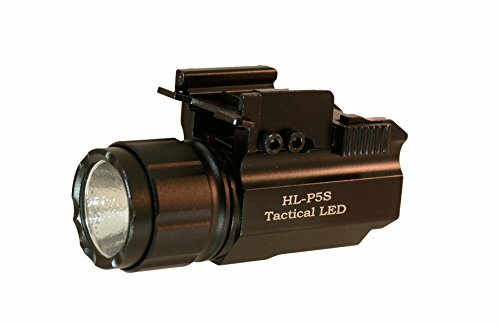 The best pistol light manufacturers make their rail mounted flashlights to fit on either type of rail, which are called universal rail mounts. For handguns that do not have a dedicated rail, there are companies that have made add-on rails that connect to the trigger guard. A good handgun light needs to be durable and be able to withstand the shock of bullets being fired and then you need it to have all of the features that you want. Some features that you may want on your pistol light are an offset flashlight mount, a quick release pistol light, tactical pistol light laser combos, or a pistol light with a pressure switch. Offset Pistol Light Mount: An offset pistol light mount is a mount that holds the flashlight off to the side of the handgun rather than directly below the barrel. An offset mount allows you to have your thumb right near the on/off switch and frees up space underneath the barrel. Quick Release Pistol Light: A quick release pistol light are for those users that will be taking their lights on and off of their handguns frequently. Tactical Pistol Light Laser Combo: A tactical pistol light laser combo are for people that really feel that they need both on their gun, a pistol light for illumination, and a laser for aiming. Pistol Light Pressure Switch: A pistol light pressure switch allows you to move the on/off switch on the light wherever you feel is the most comfortable. You replace the tail cap switch with a pressure switch that you can locate anywhere on your gun. The way that you use a tactical handgun light is very very important. You need to know that wherever you are pointing that flashlight, you are also pointing a deadly weapon. You should only use a pistol mounted light in a situation that you would already have a pistol out. You should only be using a handgun light when you are identifying threats when you are using your gun or searching a building in a situation that you know is a possible tactical situation. Many want to use a pistol lights for home defense, but a home defense handgun light should only be used if you are certain that there is an intruder and you are ready to fully defend your home. This is a question that I hear all of the time: Should I have a pistol mounted light or a handheld flashlight? The answer is that you need both. There are pros and cons to both: The biggest pro is that when you identify a threat, you have it at gunpoint. The biggest con is that when you are looking for a threat, everything you point at is at gunpoint. This is a serious safety problem! You need to have both of these flashlight available since you would never want to use a handgun light in a situation where you only need a flashlight like writing a ticket – A penlight or small AAA light would be much better. It is nice to have an extra flashlight on your gun when you are in a combat situation, but you are still better off using a handheld flashlight with an FBI technique hold that puts the light away from your body and head. Switching to the pistol light once you have found your target so you can keep both hands on your pistol is a good technique. 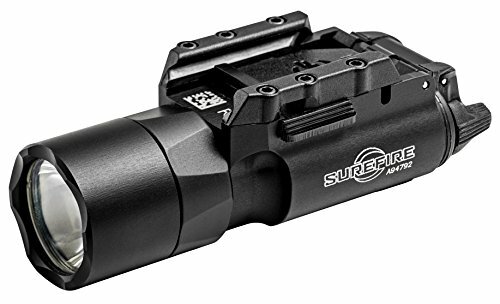 When you are talking about the best pistol light, Surefire lights are definitely going to be at the top of the list because their lights are almost impossible to beat. Every Surefire light we have ever examined has the highest build quality, which when your life is on the line you want nothing less than the best. 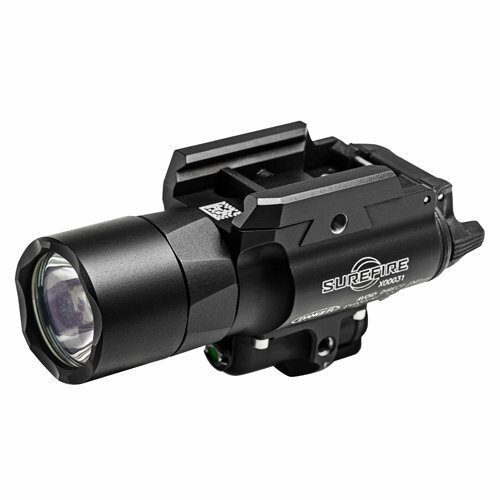 The Surefire X300 is like many other Surefire lights, it is quite powerful and pretty much indestructible. The light itself is made from high-strength aerospace aluminum with Mil-Spec anodizing and is O-ring and gasket sealed to make it weatherproof. The X300 Ultra features a new mounting system that allows you to quickly and securely mount the light to a handgun or long gun. The new mounting system is a T-slot mounting system with a tightening screw and a T-slot mounting rail. Both Picatinny and Universal crossbar wedges come with the pistol flashlight to make securing the light pretty much foolproof. The X300 comes with two high-energy CR123A batteries that will last for one and a half hours before needing to be replaced. The batteries that come with the light have a 10 year shelf life. These two batteries are strong enough to emit 600 lumens with the high performance LED. The LED provides a white light that is focused by a TIR lens. The TIR lens provides a high intensity beam that gives users an extended range, as well as enough surround light so you can keep your peripheral vision in close quarters. Activation is done via a new and improved ambidextrous switch, which is now wider and shorter than before. The switch is located at the rear of the light’s body and requires one finger for operation. The X300 Ultra can also be activated remotely via the optional DG grip for handguns and the XT tape switches for long guns. Read our full Surefire X300 Ultra Review. Streamlight comes in at a close second to Surefire when it comes to manufacturing the best glock light, between the two there is almost a monopoly in the handgun lights division. A perfect example of their top quality pistol light is the Streamlight TLR-1 HL that is made from machined aluminum with a black anodized finish. It is also sealed, which allows it to obtain an IPX7, so it can be used in all types of weather. The light comes in flat dark earth brown, flat dark earth, and black and is constructed to fit in all light bearing holsters. The TLR-1 HL is designed to mount directly to any handgun that comes equipped with Glock-style rails. The light can also be mounted to Picatinny rails. The pistol light attaches easily and securely to the rails with no need for tools or putting your hand in front of the muzzle. If you wish to mount the TLR-1 HL to a long gun Streamlight does make a mounting kit, but it must be purchased separately. The kit includes a thumb screw, mounting clips, remote pressure switch, and a “safe off” door switch in addition to two CR123A batteries. The TLR-1 HL uses two CR123A batteries to power the C4 LED for up to 1.75 hours. The C4 Led can emit up to 800 lumens that has a peak beam intensity of 15,000 candelas. The beam can reach up to 800 feet, plus with the use of a TIR lens the concentrated beam also provides perfect peripheral illumination. The TLR-1 HL features an ambidextrous switch that is used to provide power to the light, as well as enable and disable the programmable strobe. If you look at our table of the best pistol flashlights, you can’t help but notice that majority of the lights are SureFire or Streamlight. The reason for this is that these two companies manufacture the highest quality pistol flashlights in the market. When your life is on the line, you don’t want an inferior product that might fail. The only exception that we have found in our search for the best pistol lights is the Inforce APL, which we have to say is considered to be of very high quality. The Inforce APL requires a single CR123A battery to emit 200 lumens of white light from its LED for a period of one and a half hours. For users who prefer paddle style switches versus toggle switches, the Inforce APL offers ambidextrous paddle switches that provides you total control using the pointing motion of your finger. The integrated mounting system is compatible with Universal and Picatinny rails and the new screw is more secure than the old flip lever mount. The light also comes with a shut-off feature that allows you to deactivate the switches for transporting purposes. 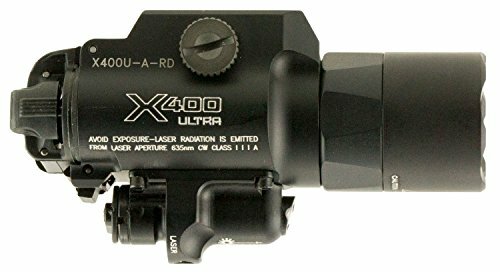 If you are looking for the best pistol flashlight that provides white light for illumination as well as a red laser light for aiming purposes, the SureFire X400 Ultra Red is the perfect light for you. The combination of white light and laser aiming capabilities makes this light the perfect choice for close to medium range activities, plus being made by SureFire you know you can depend on the light to work when you need it the most. Like many other SureFire models, the X400 Ultra is made from high strength aerospace aluminum with a Mil-Spec hard anodized coating and is O-ring and gasket sealed to keep out moisture and dust. 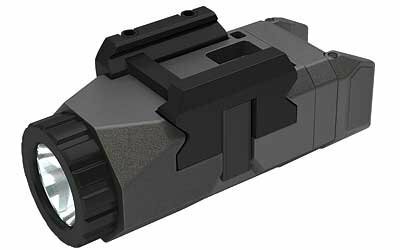 The five milliwatt laser sight is located just below the primary light on the X400 Ultra. In this model the laser emits a high-visibility red laser beam. The beam can be adjusted and features Nylock screws that are made to withstand various strengths of recoil. What this means for you is you won’t have to re-zero the laser every time you fire a round. The LED emits up to 600 lumens of white light using a TIR lens to provide a tight beam with enough surrounding light for your peripheral vision. The 500 lumens are plenty bright enough to blind a potential attacker and will last for 1.75 hours using two CR123A batteries. The X400 Ultra is activated via an ambidextrous switch that is located towards the rear of the light. The switch is operated using a single finger. Simply press the switch to turn on momentary activation or flip the switch for constant on. The light features a separate switch at the back of the light that allows you to choose between white light only, laser light only, combination of lights, or to deactivate the light entirely. The X400 Ultra can be attached to either a handgun or long gun with Universal or Picatinny rails quickly and securely thanks to its T-Lock mounting system. Adapter mounts can also be purchased separately for handguns that are non-railed. Before we get too far into our review of the Streamlight TLR-2 HL, I want to take a minute to mention something about the pricing. We have included the TLR-2 HL as a budget option but that doesn’t mean that it is a cheap pistol light. 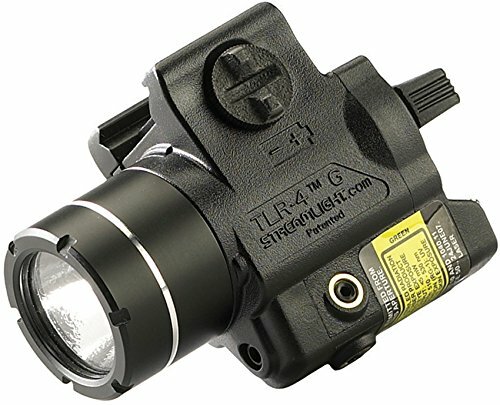 The Streamlight TLR-2 HL is cheaper than the SureFire models, but it is still a bit pricey. The thing is when it comes to a life or death situation, you do not want to purchase a light that is offered at a super budgeted price because you don’t want to risk it failing when you need it most. The TLR-2 HL emits up to 800 lumens of bright white light using a C4 LED for a period of 1.75 hours with two CR123A batteries. The 800 lumens provides plenty of light for temporarily blinding attackers or searching through dark rooms, plus its wide beam pattern lights up wide areas for a more efficient search. The red laser is used for aiming purposes and can be used with the LED or on its own. Run time for just the red laser function is 45 hours off of two CR123A batteries. The light will mount to any handgun that is equipped with Glock-style or Picatinny rails with a rail grip clamp system. The system can be securely attached and detached with no tools, plus the want the light mounts to the gun your hand will never go in front of the muzzle. The ambidextrous switch is a toggle switch that allows for one finger operation for constant and momentary on. The strobe feature is also controlled via a double tap to the left side switch. If you are looking for a lightweight pistol light that fits compact and subcompact handguns, the Streamlight TLR-4 is the perfect choice. Made from an impact resistant polymer with an anodized aluminum face cap and a Borofloat high temperature glass lens, the TLR-4 is one of the more durable lights on the market. The TLR-4 might not be one of the newer lights on the market, but it uses C4 LED technology to emit up to 125 lumens with a single CR2 lithium battery. The TLR-4 also features a 640-660 nM red laser for aiming accuracy. The TLR-4 comes with a key kit to fit a variety of different weapons, including full sized handguns as long as they have rails. The rail clamp is used to quickly and safely attach and detach the pistol light from the side of the weapon. The design allows you to snap the light one with one hand without ever having to put your hands in the front of the muzzle even if you are tighten it. The light is controlled via an ambidextrous switch that provides you with the ability to select between momentary and constant on. The TLR-4 also features a mode selector switch that allows you to choose LED only, laser only, or both laser and LED. The laser can be zeroed in via a windage and elevation adjustment screw to ensure proper aim is achieved. Read our full Streamlight TLR-4 Review. With the SureFire X400 Ultra Green pistol light, I am not going to go into a lot of detail about the lights features because it offers the same thing as the SureFire X400 Ultra Red. The only difference between the two lights is the five milliwatt laser sight. With this light, the laser is a 505 nM high visibility green laser beam rather than the red. Both lights offer the Nylock screws to help with adjustments, both offer 600 lumens of white light illumination, and both lights offer the ambidextrous switch that requires one finger operation. Like the X400 Ultra Red, the Ultra Green can fit on both handguns and long guns, its T-mounting system fits Picatinny and Universal rails, plus adapter kits are sold separately for non-railed guns. 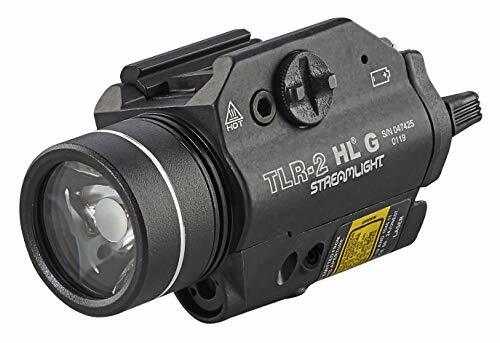 The first thing that I want to mention in regards to the Streamlight TLR-2 HL G is that just like the original TLR-2 HL model it is listed as a budget light, but the price is not going to be as low as you expected. We include the TLR-2 HL G as a budget model because it is quite a bit cheaper than the SureFire models, but it is still a pricey light when you compare it to other brands. As we mentioned before we stick with the SureFire and Streamlight brands as the best pistol lights because they are the highest quality pistol lights available in the industry today. Time and time again Streamlight, along with SureFire have proven that their lights can be counted on not to fail in a life or death situation. 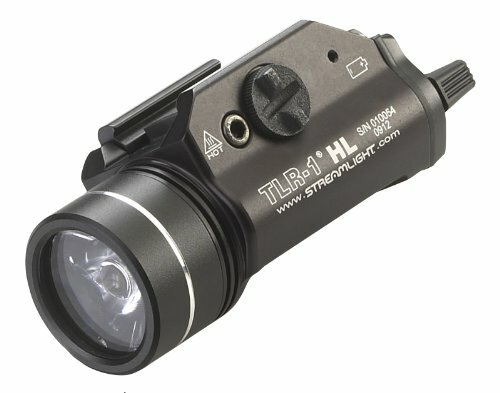 The Streamlight TLR-2 HL G is quite similar to the TLR-2 HL. The biggest difference between the two lights is the TLR-2 HL G comes with a 510-530 nM direct drive green laser. The other difference between the two is the runtime off the two CR123A batteries. The TLR-2 HL G has a shorter runtime because it only lasts for about one and a half hours when used in tactical situations. If you are using the green laser, you will see an average runtime of 17 hours. One of the great things about the green laser option is it gives you a highly visible green light that is ideal for long range targeting. 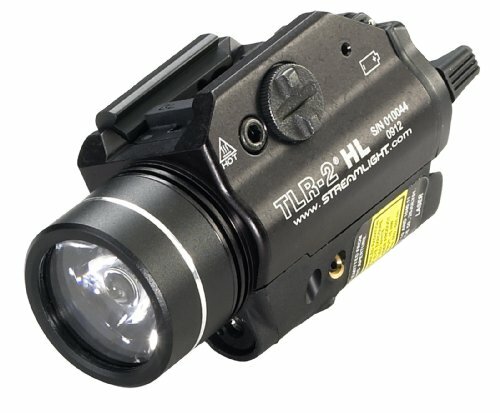 The TLR-2 HL 2 G is much like the TLR-2 HL models in the fact that it provides 800 lumens of white light in a wide beam pattern. They both feature ambidextrous switches for one finger operation, both have a user programmable strobe, and the rail clamp system is designed to make it safe and easy to attach or detach the light from your handgun. The Streamlight TLR-4 G and the Streamlight TLR-4 are pretty close to being the same pistol light. They have more similarities than they do differences. Just like the TLR-4 the TLR-4 G offers users an ambidextrous switch for one finger operation. It also offers a rail clamp that allows it to be quickly and safely attached or detached from the side of the weapon rather than having to put your hands in front of the muzzle. 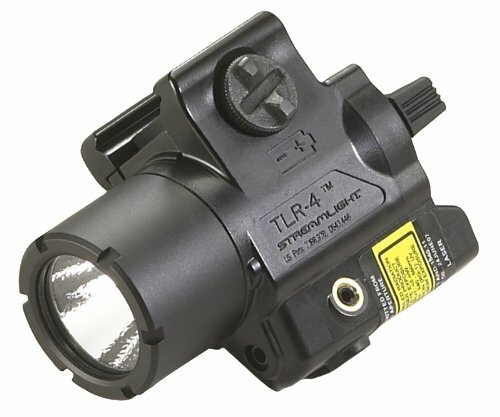 The TLR-4 G has a Borofloat high-temperature glass lens and can be used on compact and sub-compact weapons. Now let’s take a moment to look at how the TLR-4 G differs from the original TLR-4. The biggest difference is the high visible 510-530 nM green aiming laser. This laser is perfect for long range targeting. The other difference is the TLR-4 G only offers 115 lumens of white illumination, which is a little less than the original model but still plenty bright enough to enable you to safely clear a room. The TLR-4 G also comes equipped with a mode selector switch that allows users to choose between LED only, laser only, and laser and LED. Laser only mode runs for four hours, LED only runs for 1.75 hours, and the LED and laser mode runs for 1.25 hours off a single CR2 battery. 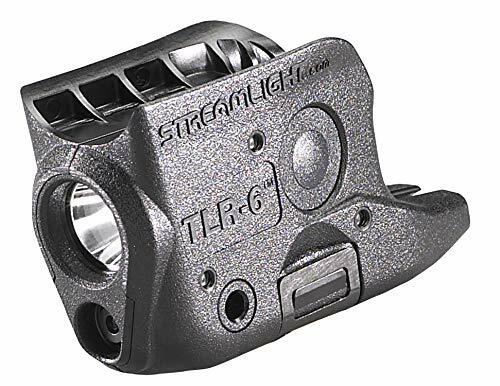 The Streamlight TLR-6 is one of the newest products being offered by Streamlight. The TLR-6 is the perfect pistol light for the smallest handguns, as well as sub-compact handguns. The TLR-6 comes with a universal kit that comes complete with six housings that are compatible with over 18 plus subcompact handguns. The kit also comes with a light/laser module. The housing is countered so that it safely and securely attaches to the trigger guard. The light also comes with a cover that is easy to attach or remove. The light itself features a C4 LED that offers users 100 lumens of white light as well as a 640-660nM red laser light for long target aiming. The TLR-6 uses two CR1/3N batteries to provide 11 hours of laser only use and one hour of LED or laser and LED use. Unlike other lights, the light doesn’t have to be removed from the handgun to replace the batteries. Even better is the laser sight requires no adjustment after a battery change. The ambidextrous switch is a push button style on both sides of the light. The switch can be used to access the three different modes available on this model. Each of the three modes also offer a 10-minute auto shut off feature to help conserve battery life. The laser/light module is made for backward and forward compatibility. The TLR-6 is made from high durable, impact resistant polymer allowing it to withstand impacts up to about three feet and an IPX-4 rating. The most important thing you have to know about this pistol light is that it is not one you want to rely on if you are in a life or death situation. If you are purchasing a pistol light that you want to be assured won’t fail when you need it most, you want to go with one of the above mentioned lights. The Aimkon HiLight P5S should only be used on airsoft style guns, paintball guns, or if you are just doing a little target shooting at the range. In other words, this pistol light is the best one if you plan to use it more like a toy than a serious pistol light. The Aimkon HiLight P5S is a subcompact pistol light that also offers a red laser for aiming purposes. The P5S offers users 400 lumens via a CREE XM-L2 LED. With this pistol light you can choose between constant on and strobe mode. This pistol light will fit majority of subcompact and full sized pistols with rails. The light uses a quick release mount to attach to the weapon. The P5S comes with a CR2 lithium battery and a one year warranty. Olight is one of the top flashlight manufacturers in the industry. Their handheld lights are easily some of the highest quality lights in the industry. 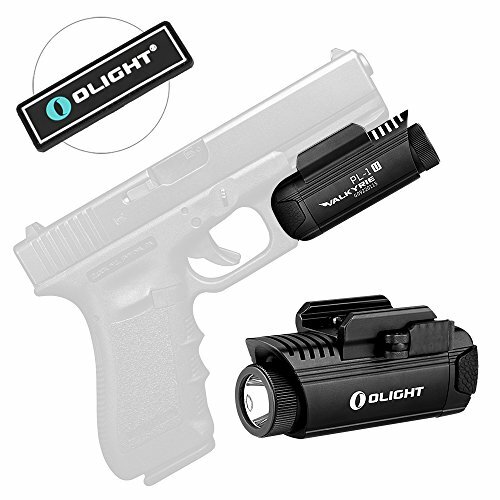 The Olight PL-1 Valkyrie is their first attempt into pistol lights. While we know their handheld lights match the quality of Surefire and Streamlight handheld lights, we don’t know is how their pistol lights are going to work out. With how important these pistol lights are in certain situations we want to wait and see how this light plays out. We know current users are loving this light. They claim it has great balance of size, perfect brightness, and the price is just right. While we are excited to see what this light has to offer, including further revisions of the light, we don’t want to include it in the above categories because we want to see what happens when more people start using it. We want to wait and see if problems start coming out before making our final decision. The PL-1 Valkyrie can be mounted to any handgun that comes equipped with a Picatinny rail. It uses a single CR123A battery to power its blue and white LED that is able to emit 400 lumens. The PL-1 features a side swing-bar mount to make attaching and detaching a breeze. The ambidextrous switch can be pressed or pushed to access different output settings. The blue LED is a navigational LED that emits two lumens while the main light is the white light. Who makes the best pistol light? The market is dominated by SureFire and Streamlight but a few small producers are making some space for themselves in the industry. Here we only included lights that are dedicated weapon lights. There is a whole other segment of handheld lights that can be connected by 3rd party or manufacturer adapters. Learn more about other pistol lights is here. The main thing to remember is that you should never only carry a light on your pistol as your main light. You need to have some kind of flashlight that you carry everyday to provide light in most situations. Thank you for reading our article on the best pistol light. If we have helped your search in any way please use one of the links above to go to Amazon and purchase your new pistol light. We are part of the Amazon Associates Affiliate program and we receive a small commission from Amazon with no extra cost to you for each purchase made through one of our links – this is how we keep this resource going. If you liked this article, we encourage you to check out our other articles about the best flashlights by type. In addition if you are new to flashlights read through our flashlight buyers guide to help you discover the best tactical flashlight for you.